The classic mall-casual clothing brand for young people, Aeropostale has the latest in high-quality apparel and accessories for boys and girls. From the latest cuts in denim and practical everyday styles, Aeropostale’s established spot in your local mall will have everything you need to be chic at school and through the holidays. We're still gathering deals for 2019, so check back later! Already know of some? Help out your fellow shoppers! Click here to view all stores flyers! 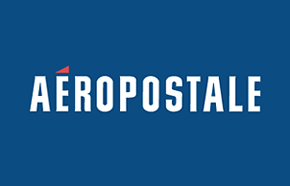 Aeropostale Canada Boxing Day Deals Sale: Get to Aéropostale Early on Boxing Day Dec 26, 2015. Deals & Steals starting at $6. Plus! Take $10 Off (any purchase of $40 or more. valid 12/26). Our Gift To You! FREE fleece blanket (with $50 purchase. while supplies last). A Huge sale, up to 70% off everything. You will want to shop Boxing Day 2013 at Aeropostale in the Vaughan Mills Mall! On Thursday December 26th, 2013 Aeropostale will open at 6AM for their Boxing Day Sales. Aeropostale specializes in casual apparel and accessories mainly aiming at 14 to 17 year old young ladies and men through their Aeropostale stores and 4 to 12 year old children through their P.S. From Aeropostale stores. Don't miss this sale! Check out Aeropostale's inventory here and you will see this sale is where you want to be! Aeropostale Boxing Day/Week Sale for 2012 starts on Friday December 26. Aeropostale Canada stores will open early on Boxing Day. Everything will be on sale for up to 70% off. On top of that don't pay tax on anything and there are surprise door busters! Be the first to get the hottest Boxing Day deals! 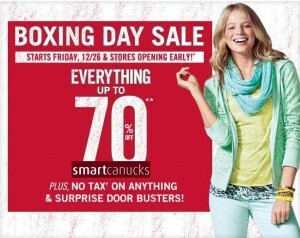 You'll recieve the hottest deals in Canada for Boxing Day, so you can save more these holidays! We also promise to never share your information with anyone else.